A little 'online neighbourhood watch' item for you now - Nicola has been in touch to let me know about that one of these rather smart bikes, belonging to her other half, was stolen from outside Worcester Park station on Wednesday. The police are looking at CCTV, but Nicola is trying to get as much info out on this as possible as it is an unusual bike with not many in the area and therefore could be easily identified if someone tries to sell it on. 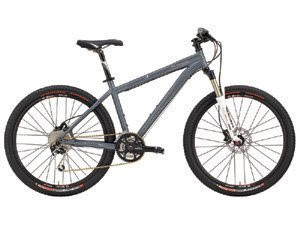 The bike is a Specialized Rockhopper Pro, normally retailing at £900, so if you do find yourself offered one in the pub, or spot one for sale locally then do let your local boys'n'girls in blue know about it. At ease, ladies and gentlemen.